The Future Innovators Scholarship Reception will recognize graduating high school students who are pursuing a STEM-based major in their college studies with the Future Innovators Scholarship. 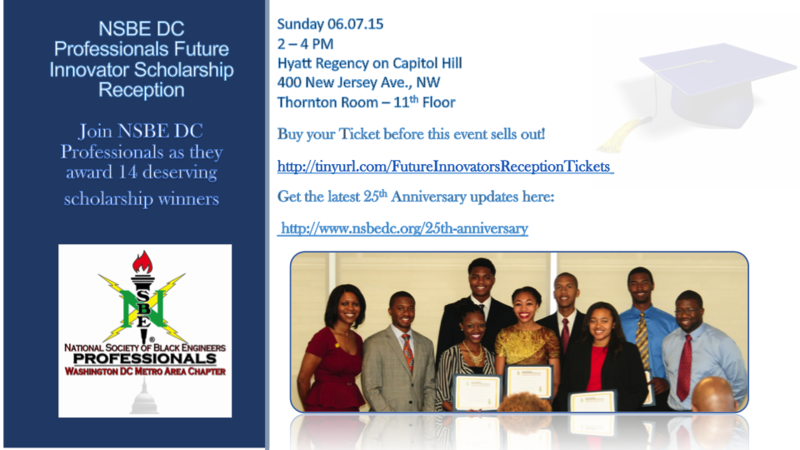 This will be a memorable and sophisticated event where NSBE DC honors these scholars for their exemplary academic records and outstanding community service. Come, witness first-hand how we are fulfilling NSBE mission to increase the number of culturally responsible Black Engineers by helping us to celebrate these scholarship recipients! The Reception will take place from 2pm-4pm at the Hyatt Regency, Thornton Room on the 11th Floor.